What non-park things can you do at Disney?? The answer is – PLENTY! Disney is not all about the parks? YES, IT’S TRUE! There are so many things that you can do without being in the parks for rides, shows or attractions. This last visit to Disney we tried fishing at Disney for the first time. 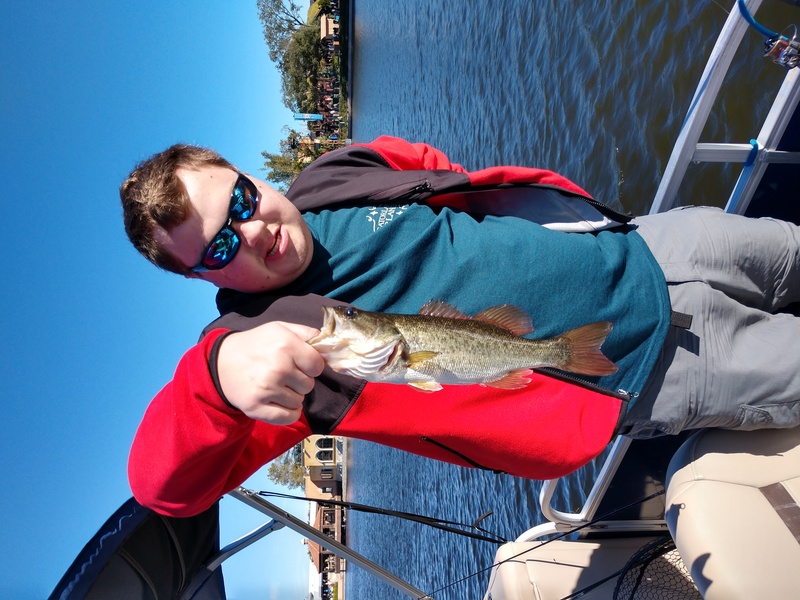 My nephew loves fishing and we decided it would be safer on Disney property and if it were anywhere near as fun as the parks we would have an incredible time – and WE DID! If fishing is your idea of a fun, non-park activity you have multiple choices for fishing locations on Disney property. You can go for 2 or 4 hour guided tours every day of the week. They provide the tackle, bait and non-alcoholic beverages. We chose to go from the Yacht Club so we could fish the Epcot area (and Hollywood Studios as well). Our captain was Luke – he was fantastic!! He baited the hooks and took the fish off the lines for you. He even held the fish if you didn’t want to so you could get a picture of it. We chose the 10 am, 2-hour tour. We boarded our boat and headed over to Epcot World Showcase. We started catching fish almost immediately which made it great right from the start. We had to leave the Lagoon by 11 Am, which is the official opening time for World Showcase. We then moved over to the docks by the Yacht club and caught even more fish!! I would be surprised if you didn’t catch many fish, as the captain’s and guides know just where to go. Over the course of the trip we caught 25-30 large mouth bass between the 3 of us.My husband caught the biggest fish, but I had one that went off line just before getting him onto the boat- no, that is not a fish story!! This fishing excursion was something that I will never forget and created amazing memories for all of us. Here is a link for more information from Disney: https://disneyworld.disney.go.com/recreation/fishing/. The phone number to call for reservations is 407-939-2277. Check out the list below for several other excursions and treats you and your family can enjoy when you aren’t in the parks. A new way to make new memories at Disney!! Are you a golfer? Did you know that there are 4 golf courses that you can use? You can rent clubs, golf carts and have a wonderful time. Check out this link for more information: https://www.wdwinfo.com/recreation/golf_main.htm. Call for reservations/tee-times 407-939-4653. Not ready to hit the fairways? Don’t worry – Disney also has 2 miniature golf courses that you can try. Each has a different theme and are great fun – Fantasia Gardens and Winter Wonderland. I have personally tried both and do not have a favorite – they are both wonderful! How about going horseback riding?? Yes, you can ride horses! You go to Fort Wilderness Resort and the Campgrounds to go horseback riding. It could be a wonderful experience for you and your family. Here is a link to Disney: https://disneyworld.disney.go.com/recreation/campsites-at-fort-wilderness-resort/horse-trail-rides/. Call 407-939-7529 for reservations. I love horse drawn carriage rides!! It’s fun to make a tradition out of taking a horse drawn carriage ride wherever you go! I have done this in New Orleans, St. Augustine, Niagara Falls, and a couple other places – Disney is next on my list! During the holidays they even offer a sleigh ride – perfect for the kids! Carriage rides are available at Port Orleans Riverside or Fort Wilderness Campgrounds. Here is a link with more information from Disney: https://disneyworld.disney.go.com/recreation/carriage-rides/ Call 407-939-7529 for reservations. Now this is something many of us can relate to, especially busy Moms who really want to just be pampered for a couple hours. Disney has 2 incredible spas that you can go to. Both are called Senses, one is at Grand Floridian and the other is at the Saratoga Springs Resort. I can tell you that my niece REALLY enjoyed her time at the Spa at the Grand Floridian when we were there. It was amazing how relaxed she was when she was done. Here is a link to Disney for more information: https://disneyworld.disney.go.com/spas/grand-floridian-resort-and-spa/senses-spa/ For reservations call 407-939-7727. Maybe you could make a surprise reservation for that special someone or to celebrate. So, next time you’re taking a day off from park hopping, try one of these fun activities available to you at Disney and discover a new way to make memories at the most magical place on earth!